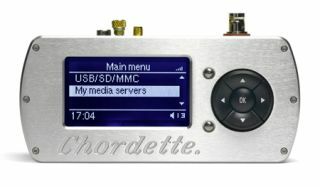 BRISTOL SHOW 2012: Chord Electronics unveils its first network music player | What Hi-Fi? Chord Electronics has unveiled its first network music player today at the Bristol Sound & Vision Show. The all-new Index joins Chord's Chordette range and is a compact music streamer and internet radio source selling for £990. Index will find and play stored music, whether on a NAS drive, networked computer or a USB drive. It can handle almost any audio format including FLAC, WMA, AAC, WAV and MP3. It also offers access to more than 10,000 internet radio stations via the vTuner service. Users can control the device using a tablet or smartphone app, with the diplay showing full-colour artwork and track info. An infra-red remote control is supplied as standard. There's wi-fi or wired ethernet connectivity, DLNA compatibility, plus a fascia-mounted USB input, coaxial and optical digital outputs and RCA analogue outs. A 128x64 dot matrix display and four-way navigation keys complete the spec list. Chord says the Chordette Index will be available in the UK at the end of February.